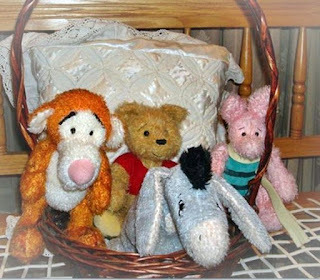 Kleintjie sent this photo of a collection of Winnie the Pooh characters that she made here at Tin Soldiers over the last few years. She says that her grand daughter loves them to bits. Isn't it wonderful to have a set of hand made animals to play with, rather than the mass produced toys one sees everywhere? I'm sure the little girl is going to grow up with happy memories of her grandmother and her childhood. What a lucky girl to have toys that grandma made to play with. Yes, aren't they gorgeous. I believe that human families are 'stitched together' with this kind of love! Wish I could also make it! Care Packages for the Elderly - We did it!